Walther Model 5 at top and .25 Velodog at bottom left, with Kel-Tec P-32. I admit to having a longtime fascination with small, concealable guns. I especially like the ones that are finely crafted and beautifully finished, like the Baby Browning or the Walther Model 5. 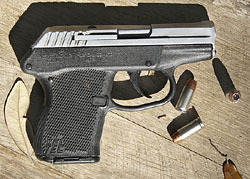 Rarely does one come along that can be admired purely for its eminent practicality, but such a gun is the Kel-Tec P-32. Having grown up with blued steel guns, I have an innate tendency to think all plastic (polymer) guns are ugly. But, given time and an even remotely pragmatic bent, one can come to see them as beautifully efficient. The attributes that make the P-32 beautiful can be enumerated fairly quickly: it is small and slim, reasonably safe, reliable, holds 8 rounds, has a locked breech, low recoil, a 5-6 pound trigger pull, and is comfortable to carry. I can’t say for certain, but the P-32 is probably the slimmest gun currently in production. Certainly there have been slimmer guns made in the past, but not many today, and none with the relative firepower of the P-32. As for weight, there is no contest. The ancient Melior Model 1911 was much more slim than the Kel-Tec, its other dimensions being relatively similar, but it weighed twice as much as the Kel-Tec. The Walther Model 5 and the Bernadelli Vest Pocket are both considerably smaller than the Kel-Tec, yet weigh virtually the same fully loaded. An old Velo-Dog .25 revolver weighs a couple of ounces less than the P-32, but its 5 rounds of .25 look distinctly puny next to 8 rounds of .32. The venerable 1908 Bayard is actually slightly smaller in all dimensions (the smallest .32 of its day) but weighs nearly three times as much as the Kel-Tec and holds 5+1 to the Kel-Tec’s 7+1 rounds. The P-32 doesn’t have a safety lever, but being a double-action-only pistol it doesn’t need one. You have to pull the trigger all the way back to make it fire--a touch won’t do it. There is a hammer block that prevents the hammer from touching the firing pin unless the trigger is all the way to the rear. The hammer is also shrouded so that, even if dropped, there is very little likelihood that the hammer can be struck. The gun has passed extensive drop testing at the Sporting Arms and Ammunition Manufacturer’s Institute (SAAMI). I believe it is a much safer gun to carry than the vast majority of single action automatics on the market. One occasionally hears a complaint about the reliability of the Kel-Tec P-32, but complainers are rare by comparison with folks who have never had a problem with their gun. I’ve had mine long enough that I’ve experienced just about every problem possible, but I have to say it is far and away one of the most reliable small automatic pistols I have ever owned. That is also the word I hear from most owners of the P-32 and its sibling the P-3AT. They are widely carried by law enforcement officers as backup guns precisely because of their small size and reliability. The most common problem, encountered with any automatic, is “limp-wristing.” An automatic pistol must be held firmly because it needs something to recoil against--otherwise the action doesn’t cycle correctly and you get failures to feed or eject. The second most common problem is rimlock. John Browning designed both the .25 ACP and .32 ACP cartridges with rims so they could be used in revolvers as well, but this can cause problems if the rim of the topmost cartridge should ride up and over the rim of the cartridge below it in the magazine. This mostly happens with hollow point ammunition, which is often shorter than hardball. The fix is to use hardball ammo, or modify the magazine. The P-32 has a locked breech mechanism, which is relatively rare on a .32 caliber pistol. The locked breech means that more of the energy of each round is going into pushing the bullet out the barrel and less of it is being wasted pushing the shell casing out of the chamber. The locked breech also tends to reduce felt recoil and make the gun more controllable. Despite the long double action trigger pull, it is a relatively light 5 to 6 pounds on most P-32s. Sights have always been an issue with the gun. The early version of the P-32 (which is what I own) had a slide milled from a hexagonal steel bar, with one of the “points” of the hexagon on top of the slide. Essentially, you line up a front triangle sporting a dab of red paint with a rear blob of red paint and sight along the top of the gun. It is a terrible setup. I came to love the gun anyway because of its other great qualities. The P-32 is a personal defense weapon. With its long double action trigger pull, it isn’t practical for plinking or target shooting. After several years with this gun, at 10 yards I can keep all the rounds on a paper plate, which is perfectly adequate for self defense. 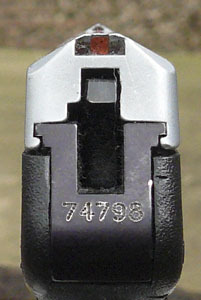 The later version of the P-32 has its slide milled from a square steel bar, is flat on top, and has genuine sights. I’ve shot one of these, and while I feel more comfortable with a gun with real sights, I’m not any more accurate with the new design. The argument (if there is one) over sights is really moot. The gun is what it is, and it is not a precise shooter--it was never intended to be. In many ways, the poor sights have encouraged me to simply point the gun and pull the trigger--a kind of instinctive point shooting method, which is probably better than aiming at close range anyway. There have always been concerns about the stopping power of the .32 ACP cartridge. 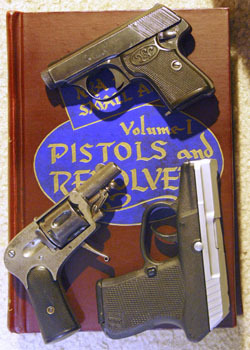 However, Marshall and Sanow state, in their book Handgun Stopping Power, that they had not planned on including information about any cartridge smaller than the .380, but encountered so many instances of one-shot stops by the .32 Winchester Silvertip that they included it in the book. It is an excellent cartridge for defensive carry. The Kel-Tec P-32 is the most carryable gun I’ve ever owned. Sure, I’d prefer to have something larger with me, but that isn’t always possible. Summer in Texas is t-shirt weather, and it can be difficult to conceal a large gun beneath a t-shirt. You can’t defend yourself with the gun you aren’t carrying, and I’d much rather have the diminutive P-32 than nothing. The weight is almost negligible, there is nothing that projects from it that can catch on clothing, and it is so perfectly flat you can easily forget it is there. 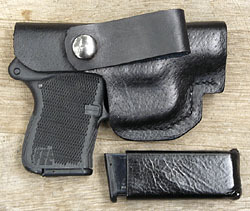 For a male, perhaps the simplest carry method for the P-32 is a pocket holster. I bought an Uncle Mike’s Sidekick, Size 1, for $10 and it has proven to be a great value for the money. It holds the gun upright in my pocket and has a band of rough material around it that seems to grip the inside of the pocket so the gun slips out easily. 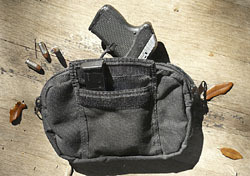 You can buy much more expensive pocket holsters, and I must admit the ones that hold a spare magazine are tempting. I might have to make one for myself. 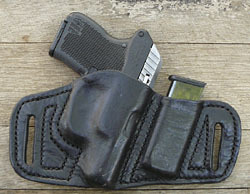 I have made both a belt holster and an inside-the-waistband (IWB) holster for my P-32. I made the belt holster to hold both the gun and a spare magazine. I always thought this was a really cool holster, but eventually I realized it was easier to carry the gun alone and put the magazine in a pocket. I made a protective glove for the magazine so I could carry it in my pocket--it is simply a piece of very thin scrap leather glued with cobbler’s glue. I’ve come to prefer IWB carry because it provides better concealment, but I know a lot of guys who prefer belt holsters. Other options include purses and belt pouches. I bought a small Uncle Mike’s Sidekick belt pouch with a hidden Velcroed pocket inside that is a pretty reasonable way to carry the gun. 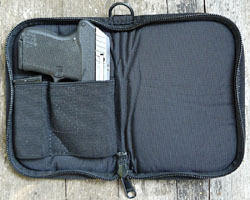 There is room for a spare magazine, Ipod, wallet , keys, or whatever. It isn’t a fast-draw rig by any means, and I worry about the loud sound the Velcro makes when I rip it loose. Possibly a better option is the DeSantis N65 Pistol Pack, which looks like a miniature daily planner and attaches to the belt with a sturdy clip. You can carry the gun on your strong side, and the zipper is a lot quieter than Velcro. Handgun Stopping Power: The Definitive Study, by Evan P. Marshall and Edwin J. Sanow.